The lost screenplay by Jim Henson brought to life by Roger Langridge! Turkey Hollow is a picturesque town where hundreds of years ago, unbeknownst to the citizens, a meteorite landed nearby a small brook on the outskirts of town. 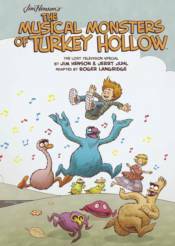 One Thanksgiving, while young Timmy Henderson practices his guitar, he's accompanied by strange, unearthly, musical sounds. That meteorite wasn't a rock at all but an egg holding seven furry, goofy monsters!